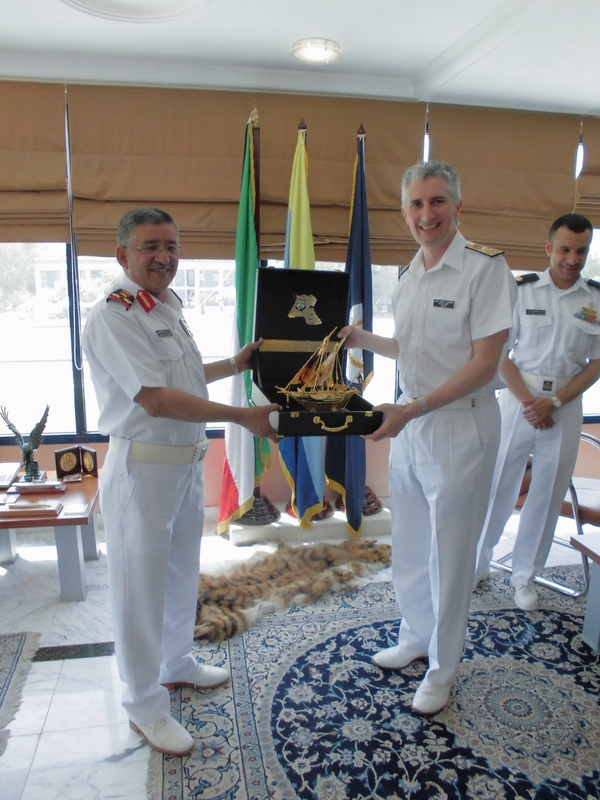 The Deputy Commander of the Combined Maritime Forces (CMF) visited Kuwait recently as part of an ongoing regional engagement program. Commodore Simon Ancona, Royal Navy, spent a day at sea onboard HMS Monmouth with students from the Mubarak Al Abdullah Joint Staff College before meeting senior Kuwaiti naval officers. Later, the Royal Navy frigate took part in a series of exercises with the Kuwaiti Navy and Air Force. During their time aboard, the Ship gave College staff and students a comprehensive display of the diverse range of self-sustaining capabilities a modern, sophisticated warship offers to CMF. Against the backdrop of Monmouth’s own impressive array of sensors and weapons systems, the guests were treated to a series of demonstrations of pursuit and boarding capabilities involving the Ship’s sea boats, Lynx helicopter and embarked detachment of Royal Marines. HMS Monmouth’s Royal Marines Boarding Team rapid rope from the ship’s Lynx Mk 8 Black Knight onto the Foc’sle as part of a boarding display as Kuwaiti Staff College students look on from the bridge. Members of the Ship’s company were also on hand to show off fire-fighting and damage control techniques, give presentations on the diverse roles it can undertake and answer questions about what it takes to maintain a warship 5,000 miles from home for over seven months, working with CMF to patrol the waters of the Arabian Gulf and Indian Ocean. importance of being able to work together for increased operational effectiveness. Jassem Al-Ansari, and Maj Gen Sheikh Mohammed Yousef Al-Sabah, the Head of the Kuwaiti Coast Guard. He said: “Kuwait provides vital support to the CMF, both in our headquarters in Bahrain and out at sea. In the waters off the Kuwaiti coast, HMS Monmouth worked with Kuwaiti Naval vessel Al-Ahmadi to perform a number of difficult exercises, including a complex set of Officer of the Watch manoeuvres that challenged the signalling and ship-handling skills of both bridge teams. This was followed closely by an impressive air display from two of the Kuwaiti Air Force’s Apache Longbow helicopters. Their simulated low level air attacks over the frigate tested the combat reactions of both Monmouth’s crew and the pilots themselves. The final stage of the exercise involved a Super-Puma Search and Rescue helicopter of the Kuwaiti Air Force. 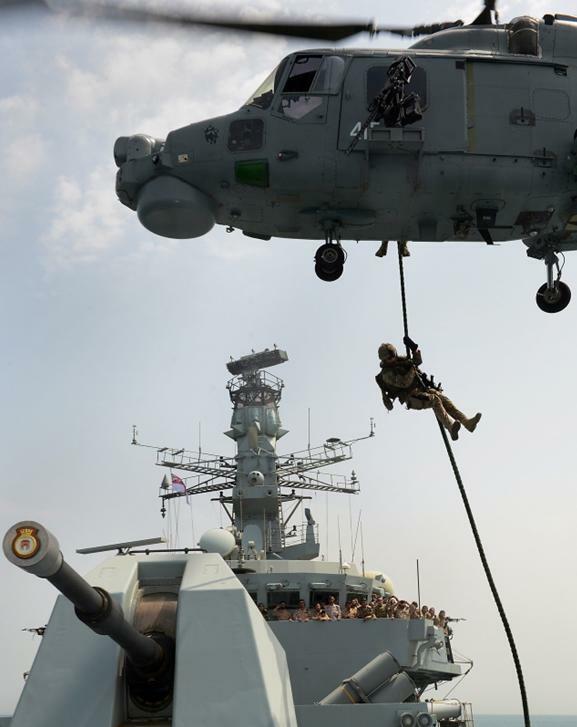 By conducting winching exercises from the flight deck of HMS Monmouth it was able to demonstrate the close working relationship the two forces have developed in recent years. Commenting on his Ship’s role in the demonstration Monmouth’s Commanding Officer, Commander Gordon Ruddock, Royal Navy , said: “Spending time at sea on a warship is the only way one can truly understand how the CMF can achieve our strategic goals at sea.